When we were young children, our parents took us on a few trips to California to visit our grandmother who lived in San Diego. On one of those trips, we drove along the California coast and visited several historic places… Walt Disney Land, San Francisco and the Golden Gate Bridge, and the Redwood Forest. But we also made a few stops that may not be as familiar to some. One of those places was Pea Soup Andersen’s. There, we tried our very first bowls of split pea soup. We were hooked from first bite! The iconic Pea Soup Anderson now boast serving more than 2 million bowls of split pea soup a year! When I got married years ago, I learned that my husband’s family had a tradition (and still does) of eating split pea soup as their simple meal on Good Friday. I have kept that tradition for my family and have served it every year on Good Friday since. But that’s not where split pea soup ends its story in our family. 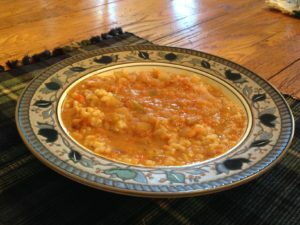 Since adopting a whole food, plant-based, oil-free diet almost 7 years ago, Paula and I have both incorporated split pea soup into our Winter (and sometimes Summer) menus! Here is one of our favorite twists on a very simple, convenient, and tasty meal of split pea soup using yellow split peas. Yellow split peas make a slightly sweeter soup…. the perfect evening meal which satisfies any time of year. Enjoy!!!! Add all ingredients to a crock pot. Cook on high at least 8 hours to achieve desired creaminess. Serve over brown rice. Add garlic powder, salt, pepper, and a few squirts of Sriracha sauce to taste.